The Basilica of the National Shrine of the Immaculate Conception is a prominent Roman Rite Catholic basilica located in Washington, D.C., United States of America, honoring the Blessed Virgin Mary as Our Lady of the Immaculate Conception, the principal Patroness of the USA. The shrine is the largest Catholic church in the United States and North America, one of the ten largest churches in the world, and the tallest habitable building in Washington, D.C. Construction of this church, notable for its Neo-Byzantine architecture, began in 1920 under Philadelphia contractor John McShain. It opened unfinished in 1959. An estimated one million pilgrims visit the basilica each year. The basilica is designated both as the national and patronal Catholic Church of the United States, honoring the Virgin Mary, under the title Immaculate Conception, by which Pope Pius XI donated a mosaic of the same image in 1923. It is not the cathedral church of the Archdiocese of Washington, which is the Cathedral of St. Matthew the Apostle. The shrine was visited by Popes John Paul II, who designated the National Shrine as a Minor Basilica on October 12, 1990, and Benedict XVI, who bestowed the honor of a Golden Rose on the basilica. Pope Francis visited the shrine on September 23, 2015, and celebrated a Mass for the canonization of Junípero Serra, O.F.M. on the mall of The Catholic University of America. The altar, ambo, and chair used for this Mass was made of wood that was made up to look like marble, and matches the existing marble in the basilica. This altar was permanently installed in the sanctuary of the Great Upper Church as the new Novo Ordo altar, and the ambo and chair was also permanently installed in sanctuary of the Great Upper Church. 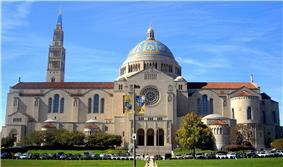 The basilica does not have its own parish community, but serves the adjacent Catholic University of America which donated the land for its construction, the United States Conference of Catholic Bishops, and hosts numerous Masses for various organizations of the Church from across the United States. The basilica is on Michigan Avenue in the northeast quadrant of Washington. It is served by Brookland-CUA Metro Station on the Red Line, roughly 1640'/500m away. As of 2015 the rector of the shrine was the Monsignor Walter R. Rossi, who holds a Licentiate of Canon Law. Exterior view of the basilica from Mary's Garden which is situated to the North West of the Shrine. The basilica houses 70 chapels honoring Mary and reflecting the origins of the Catholic immigrants and religious orders whose generosity erected them. Its Greek-styled interior is crowned with numerous domes decorated in mosaics, similar to the Basilica of St. Mark in Venice, Italy, but much larger. The mosaics feature American renditions of traditional Catholic images. Artist Jan Henryk De Rosen, who presided over the shrine's iconography committee was also responsible for much of its decor, including composing the large mosaic over the northern apse. The exterior of the basilica is 459 ft (140 m) long, 240 ft (73 m) wide, and 237 ft (72 m) tall to the top of the cross on the dome. The diameter of the main (Trinity) dome of the basilica is only 7 feet (2.1 m) smaller than that of the dome of the United States Capitol. The shrine was built in the style of medieval churches, relying on masonry walls and columns in place of structural steel and reinforced concrete. It was designed to hold 10,000 worshipers and includes modern amenities such as a basement cafeteria, hidden public address speakers to carry speech at the altar to the rear of the building, air conditioning and the largest (in 1959) radiant heating slab in the world. In all, 70 chapels and sacred images flank the sides of the upper church and crypt. It contains many works of art. There are arches outlined with iridescent Pewabic Pottery tile, large ceramic medallions set in the ceiling, and fourteen Stations of the Cross for the crypt. In 1792 John Carroll, the bishop of Baltimore and America's first Roman Catholic bishop, consecrated the newly created United States under the protection of the Blessed Virgin Mary under the title of The Immaculate Conception. In 1847, the 7th Provincial Councils of Baltimore reiterated this episcopal choice to name the title Virgin Mary, conceived without sin as the principal patroness of the land, which Pope Pius IX formalized on February 7, 1847, but was not publicly proclaimed until July 2, 1847. Bishop Thomas Joseph Shahan, the fourth rector of The Catholic University of America in Washington, proposed the construction of a national shrine to commemorate the Immaculate Conception in the country's capital. Bishop Shahan took his appeal to Pope Pius X on August 15, 1913. Shahan received the pope's enthusiastic support and personal contribution of US$400. Shahan returned to the United States and persuaded the Board of Trustees of The Catholic University of America to donate land at the southwest corner of the campus for his shrine. In January 1914, Shahan published the first issue of Salve Regina, a newsletter meant to stir enthusiasm for his project. He wrote that the shrine would be a "monument of love and gratitude, a great hymn in stone as perfect as the art of man can make it and as holy as the intentions of its builders could wish it to be." His newsletter was circulated to dioceses throughout the country and financial donations began to pour into Washington. In 1915 Father Bernard McKenna of Philadelphia was appointed by Shahan as first director of the national shrine. Shahan oversaw the construction of the shrine until his death on March 9, 1932. His body is the only one interred at the national shrine. By 1919 architectural drawings were chosen by Shahan and McKenna for the construction of the national shrine by the Boston firm of Maginnis & Walsh. At first a traditional Neo-Gothic architectural style was considered, but Shahan opted instead for a Byzantine Revival-Romanesque Revival design. Cardinal James Gibbons, archbishop of Baltimore, blessed the foundation stone on September 23, 1920. More than 10,000 people attended the Mass, including ambassadors, government officials, and military officers. In 1929 the Great Depression halted the construction above the crypt level. The beginning of American involvement in World War II stalled plans even further. After the war, in 1953, American bishops under the leadership of John Noll, archbishop ad personam of Fort Wayne, and Patrick O'Boyle, archbishop of Washington, pledged to raise the funds necessary to complete the upper church of the national shrine. On November 20, 1959, thousands of Catholics gathered with the bishops for the dedication of the Great Upper Church. The crypt has displayed the Papal Tiara of Pope Paul VI since 1968. 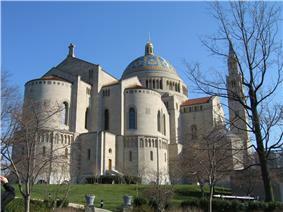 In 1990 Pope John Paul II named the national shrine as the U.S.'s 36th minor basilica. In August 2006, work was completed on a mosaic covering the Redemption Dome in the Upper Church. This is the first new work to be done in many years and was part of the original architectural plans. Following its completion in the summer of 2007, the Incarnation Dome was blessed on November 17, 2007. A small chapel on the crypt level honoring Our Lady of La Vang (Vietnam) was completed in 2006. Since 1983 the Junior Chorus of Stone Ridge School of the Sacred Heart conducted by Mrs. Nancy Fazio, sings the Christmas Eve liturgy and carols. In 2008, during his apostolic visit to the United States, Pope Benedict XVI bestowed the Golden Rose upon the Basilica of the National Shrine of the Immaculate Conception. In June 2011, a new chapel dedicated to Our Lady of Lebanon was erected within the basilica, commemorating the fidelity of the Maronite Church and its faithful. A mosaic of Saint Maroun and the Crucifixion was copied from the 6th-century Rabboula Maronite manuscript, and was donated by Cardinal Donald Wuerl. The chapel was formally consecrated by Maronite Bishop Gregory J. Mansour on September 23, 2011. On January 2013, the basilica held a public televised thanksgiving Mass and enshrined two first class relics of Americans Catherine Tekakwitha and Marianne Cope, recognised as saints by the Catholic Church. ^ The Washington Monument is taller, but is not a habitable building). ^ Morgan (2001), p. 79. Historic American Buildings Survey (HABS) No. DC-859, "Basilica of the National Shrine of Immaculate Conception, 400 Michigan Avenue N.W., Washington, District of Columbia, DC"
Old Post Office Building (Washington, D.C.) Tallest Building in Washington, D.C.
Byzantine Revival architecture in Washington, D.C.
Roman Catholic churches in Washington, D.C.
Romanesque Revival churches in Washington, D.C. Historic American Buildings Survey in Washington, D.C.